Breakfast was great!! Front desk was excellent and friendly! We received great recommendations to nearby restaurants, assisted with our transportation and breakfast at the hotel was wonderful. Scenic and direct tram around the city ride from Amsterdam Central Station to the hotel; 5 minutes to Rijksmuseum, 20 to Central Amsterdam. Comfy bed. Great staff. Very quiet, away from the crowds. 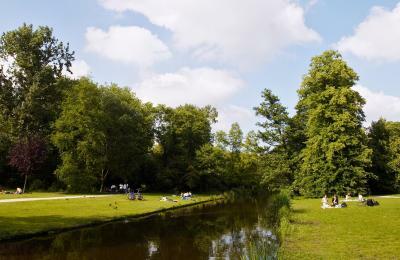 Located behind vondelpark. Easy access by tram (2 tram stations within walking distance). Staff was very helpful and nice, thumbs up for Patrick. Good value for money. Will stay here again if I come back. Everything was great. The hotel has a good location so you can enjoy walking through the park before diving into touristic city center. The bed was super comfortable and the bathroom was really nice. The Hotel is very comfortable and the location is excellent!! next to Vondelpark. The bar in the hotel is excellent with great staff. Park Plaza Vondelpark Amsterdam This rating is a reflection of how the property compares to the industry standard when it comes to price, facilities and services available. It's based on a self-evaluation by the property. Use this rating to help choose your stay! 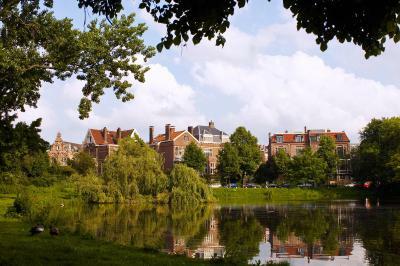 Bordering the popular Vondelpark, this hotel offers accommodations in a residential area. Amsterdam’s main attractions such as Dam Square are easy to reach from the tram stop, 350 feet away. A Grab & Go breakfast is available at a surcharge of €8.00 per person per day. The Restaurant & Bar will be open in June 2019. Free Wi-Fi is available in the entire hotel. The Cornelis Schuytstraat tram stop is located 5 minutes away by foot and offers direct access to Rijksmuseum and Amsterdam Central Station. When would you like to stay at Park Plaza Vondelpark Amsterdam? Spacious, modern room with bathrobes and slippers. Some rooms overlook the Vondelpark. Please note that bedding preference is available upon request, subject to availability. Modern, air-conditioned room ranging in size from 12 to 20 square yards, with a cable TV and a private bathroom. This studio has a mini-bar, air conditioning and cable TV. This studio features a flat-screen TV, air conditioning and mini-bar. Individual design, city centre locations and excellent facilities are key features of the upscale Park Plaza® Hotels & Resorts brand, making it ideal for both corporate and leisure guests. Every day, our leisure guests enjoy our unique combination of friendly staff, outstanding accommodation and award-winning restaurants and bars. Business travellers value our efficiency and our excellent business centres. All guests enjoy our free internet connectivity. Our portfolio of vibrant city-centre hotels and tranquil beachside resorts in Croatia already presents a wide choice of locations and accommodation. House Rules Park Plaza Vondelpark Amsterdam takes special requests – add in the next step! ATM card Park Plaza Vondelpark Amsterdam accepts these cards and reserves the right to temporarily hold an amount prior to arrival. Park Plaza Vondelpark Amsterdam accepts these cards and reserves the right to temporarily hold an amount prior to arrival. Please note that a refundable security deposit of EUR 50 is authorized upon arrival. This deposit is used for damages and extras taken in the hotel. The hotel will check the validity of the credit card at the time of booking, which may include a pre-authorization of EUR 1.00. If the credit card is proven to be invalid, you will have 24 hours to provide the hotel with a new valid credit card. Your reservation will be canceled if you fail to provide a valid credit card within 24 hours. The credit card holder must be present upon arrival with the credit card used for the booking. If a third party credit card is used, a Thirdy Party Payment authorization form must be signed by the card holder. The signed form must be completed and returned to us no later than 8 days prior to arrival. There is a maximum amount of EUR 500 per reservation. This hotel is simply adorable, super friendly staff, amazing interior and great location. An amazing hotel! Staff was very helpful, we got free breakfast (and food throughout the day) and drinks because the hotel was under renovation. The room was clean and beds were comfortable. It was super easy to get into the heart of the city, about 10-15 minutes by tram. When I visit Amsterdam again I will definitely stay here! Perfect! The design, the quiet yet central location. Some elements were not opened yet. Nothing! It was perfect all round! Everything! Perfect hotel with the most perfect location!!! Best hotel in Amsterdam! There was construction going on outside, this was not the hotels fault however. We didn't get clean glasses, towels or fresh coffee pods and the beds didn't get made. It seems like the only thing the cleaning staff did was to give us a bottle of water to 5 euroes that they then tried to charge us for upon check-out. The bathroom was a sort of glass case within the room so you could watch each other shower and the door didn't even close properly. Traveling with my partner of 3 years it was okay but it would have been super uncomfortable sharing the room with someone else. Zero privacy. Great location! The room has everything you need. Cleaning, was not great! My water and coffee cups were cleaned by hand and left in the bathroom by the cleaner. I thought they would be replaced new. Not very hygienic. I also asked at the front desk and via note but this did not change. Also behind the bed side tables there were many hairs and dust from previous people. The first room i was out into i moved straight out of as the room was horribly run down and shower filthy. The breakfast to your room service did not work. No one collected my card that I places on the door latest at 1am. The breakfast I went to get myself then in the restaurant. This was nice but the scrambled eggs I did not feel were real eggs. The waiter on the Saturday morning although made up for all of the above regarding breakfast, he was very friendly and hospitable. My king room was nice, the bathroom really nice! The front desk staff, there were 2 men, they were very friendly, helpful and understanding. Situated in nice area not too busy. Good transport links to centre or close walking distance. 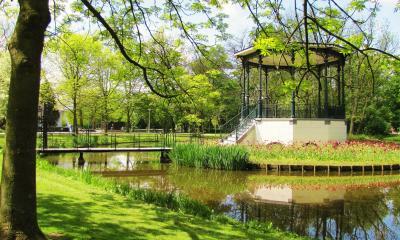 The location is wonderful as its a very short walk into the Vondel Park which is a lovely stroll to the Leidsplein. Also some lovely restaurants in a 'Dutch' rather than tourist area.